The triple star system of Alpha Centauri is only 4.3 light-years—about 25 trillion miles—away. The possibility of an earth-like world orbiting our nearest neighbor has been a kind of holy grail of astronomy — and something taken for granted by countless SciFi authors. Happily for everyone, astronomers at the European Southern Observatory in Chile recently discovered a planet with a mass similar to that of the earth orbiting the sun-like Alpha Centauri B. Indeed, Alpha Centauri Bb is the first planet with an earth-like mass ever found orbiting a sun-like star. 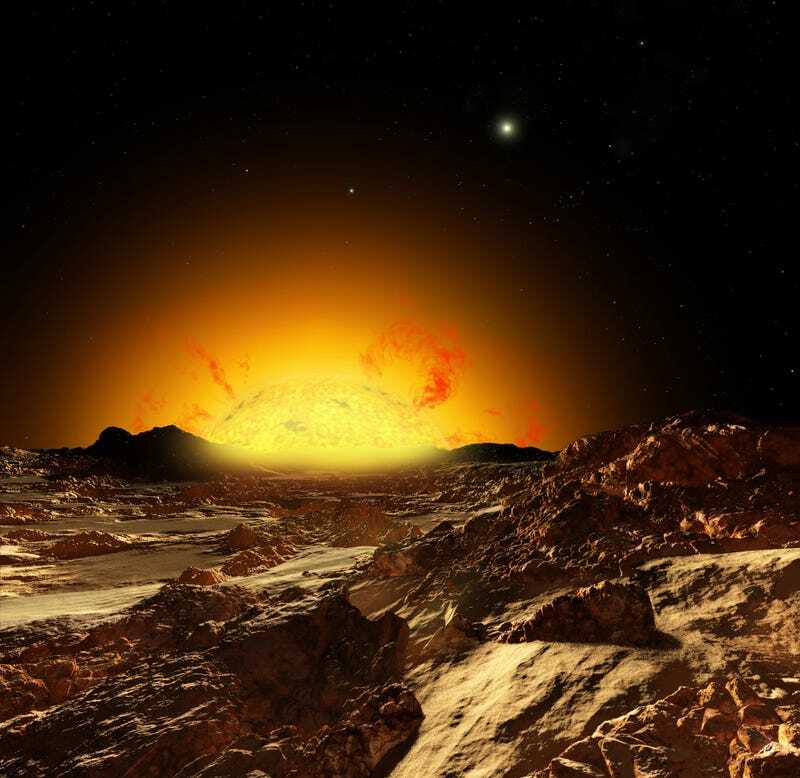 Artist’s concept of Alpha Centauri B and its planet, with Alpha Centauri A and our sun. Of the three stars in the system — Alpha Centauri A, B and Proxima — the latter is actually the star closest to our own. Proxima Centauri is a red dwarf while the the two larger stars, A and B, are similar to our sun, with B being slightly smaller and dimmer. The planet orbiting Alpha Centauri B has a mass only slightly more than the earth's. In fact, it is the lightest exoplanet yet discovered. Unfortunately for any hope of finding life on this world, it orbits only about four million miles away. More than ten times closer than the distance between Mercury and our sun, and 23 times closer than the earth. This would make Alpha Centauri B more than twenty times larger in the planet's sky than the sun is here on earth...and more than 500 times brighter and hotter. In the illustration at the top of this page, Alpha Centauri B dominates the sky. Just above it to the right is a very bright star: Alpha Centauri A. And above that to the right is another star: our sun. Astronomers using the High Accuracy Radial Velocity Planet Searcher (HARPS) at ESO’s La Silla Observatory in Chile discovered the planet by detecting the tiny wobble it causes in the motion of Alpha Centauri B as it orbits the star. The movement is minute—a snail's pace 1.8 km/hour. This discovery entailed the highest precision ever achieved using this particular technique. In Honor of National Pig Day: Pigs in Space!